Eggplant, by Flickr user liz west. Used under a CC BY-2.0 License. Biswapriya Misra is a postdoc in the Department of Genetics at the Texas Biomedical Research Institute. He loves cooking and has been honing his skills in the kitchen since he was 14 years old. One of his specialties is traditional Indian dishes. 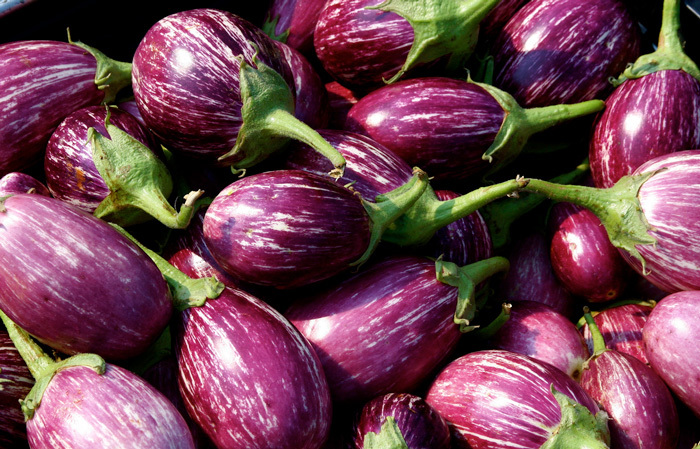 For GSA-Art he has contributed a recipe for doi-baigun, an eggplant-yogurt mix served for lunch or dinner alongside plain rice. Misra says it is fast, simple to prepare, vegetarian, healthy, and very tasty! A: Black pepper powder (to taste), iodized salt (to taste), sugar (½ tablespoon), slices of green pepper (1-2 pcs), cumin powder (½ tablespoon), and a pinch of black salt. B: Whole dried red peppers (2-3 pcs), fresh green peppers (2-3 pcs), whole black pepper (8-10 no’s), intact fenugreek (½ tablespoon), whole cumin seeds (½ tablespoon), whole mustard seeds (1- 1½ tablespoon), whole coriander seeds (1/2 tablespoon), whole fresh curry leaves (important for aroma) (10-12 pcs), finely cut garlic (4-5 pcs), finely minced ginger (10 g). First, cold yogurt is blended (a spoon will do) with items listed in A, into a fine mixture in ½ cup of water and allowed to stand. 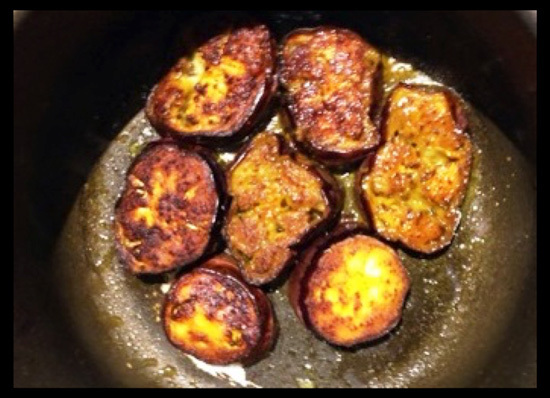 Washed medium-sized eggplants are cut into medium-sized pieces, left to soak in a pinch of salt (to your taste), a pinch of sugar, and a pinch of turmeric powder for 30 minutes. Cut slices are deep-fried in a non-stick frying pan with cooking oil for 10-12 minutes. Keep it covered and under low heat (say 5-7 range on an electric stove) until inside is well cooked. Lightly fried eggplant pieces are taken out from pan and dipped in the cold yogurt to marinate and absorb as much as possible. While the eggplant is marinating, heat two tablespoons of cooking oil on the same non-stick pan. Add the ingredients listed in B in order, cooking until fragrant. While hot, the entire mix, including the oil, are floated onto the yogurt-eggplant mix, mixed once, and rapidly covered with foil to prevent the aroma escaping. After the dish has cooled, serve with steamed white rice (Basmati is best). Both the spicy yoghurt and the eggplant pieces are eaten mixed with the rice.